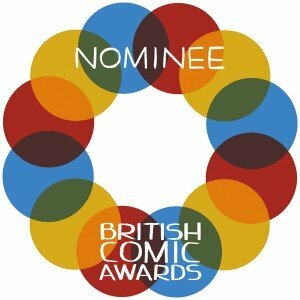 It’s a real pleasure to say that Raygun Roads, a comic that I worked on with Owen Johnson, Indio!, and Andy Bloor, has been shortlisted for ‘Best Comic’ at this years British Comic Awards. The winner is to be announced at Thought Bubble in Leeds later this month. We are amongst some hard competition though in so it will be tough but, frankly, just being nominated is Exciting enough. Also to be in that list as the only self-published title, I think, is an amazing effort when you consider the readership that something like ‘The Wicked + The Divine’ has through a publisher like Image. As if all of that isn’t exciting enough the team of judges includes the likes of Jonathon Ross, Jessica Hynes (Spaced) and Danny John-Jules (Red Dwarf). Incredible. The 3rd Annual British Comic Awards Ceremony will take place at 6pm on Saturday 15th November in the Royal Armouries Bury Theatre in Leeds as part of the Thought Bubble Festival.